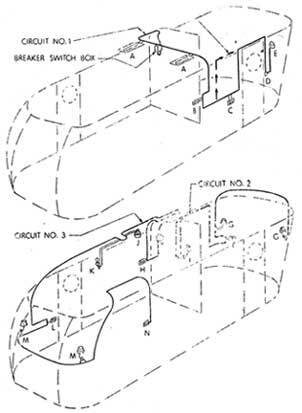 1946 wiring diagram showing 15 amp 3 circuit system. In this restoration the original cloth covered wire 15 amp service was upgraded to a 30 amp service with new wire and added outlets. This photo shows the original 15 amp 2 prong inlet into the trailer. 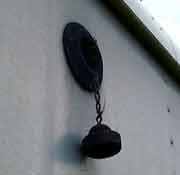 This is located midway down on the street side of the trailer. This is the replacement 30 amp inlet. It is a Hubbell marine grade stainless steel twist lock inlet. The extension cord locks into the inlet making it safer than your conventional RV inlet. Another nice feature of the Hubbell is the water tight cover which screws in place to protect the prongs and keep water out of the panel. 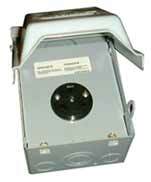 This is the replacement 30 amp 2 circuit breaker box. The power from the inlet runs to this box and is split into two 15 amp circuits. This is the 30 amp supply outlet for the trailer.